Dubai, UAE, December 13, 2017: LG has paved the way for a plethora of electronics and home appliances, however its commitment to the development of televisions and in particular OLED technology has set a new standard of excellence by which televisions today and in the near future, will be measured. LG has succeeded in increasing its share of the premium TV market via its OLED TVs, which the company first began manufacturing in 2013. The importance of OLED cannot be overstated. The technology represents a seismic shift in television design, utilizing a light source made from organic material to allow each pixel to both light up and turn off individually. OLEDs contain pixels that can individually emit the red, green and blue light required to form a complete image. Black is created by switching pixels off, rather than by blocking a backlight. The result is the true-black that LG’s OLED TVs have become well-known for. OLED displays boast lighter, durable screens, wider viewing angles, excellent color rendering and superior picture quality without distortion. With the growing demand for premium TV’s, the LG Home Entertainment Company reported its highest quarterly operating profit of USD 404.39 million and record high operating margin of 9.9 percent. Sales improved 12 percent from the same period in 2016 to USD 4.09 billion. LG’s strategy to overcome volume competition by expanding the premium component of its TV business focusing on OLED and Ultra HD TVs is proving to be a success. Sales of OLED units by the end of the third quarter were equivalent to the total number of units sold in 2016 which was more than double the 2015 figure. LG OLED TV’s share of the premium market (as defined by TVs prices 2500 or above) rose significantly over the last year, allowing the company to successfully launch new premium models and leverage its position in the markets. 2017 also witnessed the debut of LG’s amazing and incredible LG SIGNATURE OLED TV W. This outstanding feat of engineering was honored with the widest collection of TV awards at CES 2017, winning this year’s Best of the Best award. Defined not only by its amazing picture quality, but also by its jaw-dropping design, the 77-inch LG SIGNATURE OLED TV W flaunts a previously impossible form factor, featuring an amazingly thin, semi-flexible screen that attaches to the wall with magnets. Not designed to stand by itself on legs or a pedestal, it is mounted on a wall, resembling nothing like a TV. It is the ultimate expression of cinema-quality experience for the home and is now available to the avid TV consumers across the GCC. LG’s OLED TVs have been recognized for their superior performance and are used by Technicolor as consumer reference displays in the production of home delivery versions of major Hollywood movies and television content such as Logan and Sense 8. This recognition from Technicolor verifies LG’s longstanding claim that its OLED TVs enable users to enjoy premium viewing experience. “Supported by numerous accolades and reviews over the past years, LG will continue to take efforts to ensure that the latest and the best technology is implemented to provide its consumers with the best viewing experience ever. Even after OLED’s incredible reception over the past few years, LG has never been one to rest on its laurels”, added Choi. 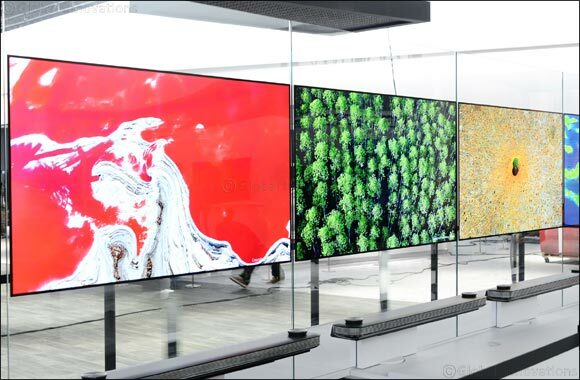 Televisions of the future will be powered by OLED technology and LG is pioneering the way forward in developing this technology to ensure users get the most out of their experience. Soon people will not just have the best viewing experience in their homes, they will have it on their phones and across a plethora of touch points to interact and engage with users as we venture into a more immersive and entertaining world.